The services sector grew in March but at its slowest rate since July 2016, with the recent bad weather having an adverse effect on performance. The Markit/CIPS services purchasing managers' index (PMI) showed a reading of 51.7 in March, down from 54.5 in February and falling short of economists' expectations of 54.0. A reading above 50 indicates growth in the sector.The report said: "Survey respondents noted that snow disruption and unusually bad weather conditions in March had been a key factor holding back business activity growth. "The weather was blamed for contributing to "subdued" consumer spending but "heightened economic uncertainty" was also described as "a brake on growth".The survey showed modest upturns in business activity and new work but employment growth slipped to a three-month low.The companies that were hiring more staff generally said this was due to the need for more operating capacity and long-term expansion plans.Some of those surveyed, however, said that tight labour conditions had made vacancies harder to fill. 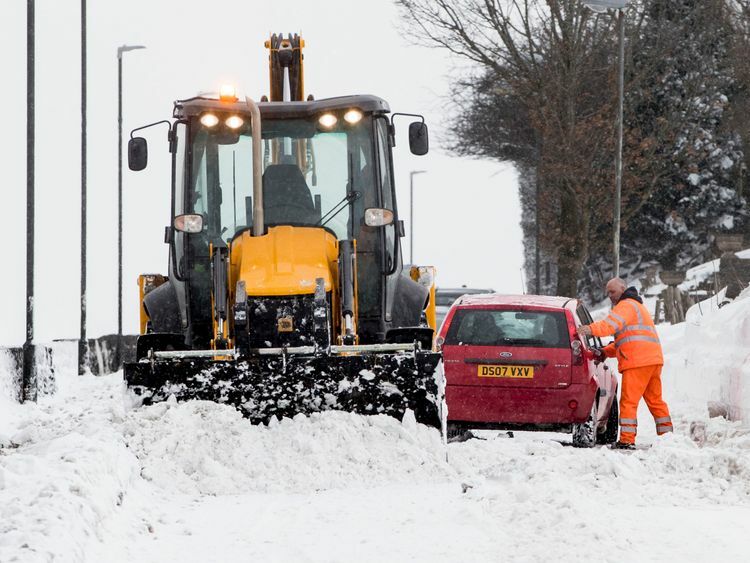 Chris Williamson, chief business economist at IHS Markit, which compiles the survey, said: "The UK economy iced up in March, suffering the weakest increase in business activity since the Brexit vote amid widespread disruptions caused by some of the heaviest snowfall in years. "As a result, first quarter economic growth will likely have been adversely affected. "The PMI surveys collectively signal a quarterly GDP growth rate of just under 0.3%, down from 0.4% in the fourth quarter, albeit with the rate of growth sliding to just 0.15% in March alone. "Duncan Brock, group director at the Chartered Institute of Procurement & Supply (CIPS), said: "Not much to be enthused about all in all, but the question remains whether this will be a sign of a more entrenched slowdown or whether the unpreparedness for unseasonal weather conditions was the root cause. "As further rises in cost burdens for the sector seem inevitable, and the Brexit shadow remains, there will have to be an injection of confidence and stronger economic performance next month to conclude March was just a glitch. "The survey comes in the same week as assessments of the manufacturing and construction sectors.Manufacturing showed a slight uptick in growth during March but construction was seen to have struggled through March's bad weather.Jordan Rochester, an FX strategist at Nomura, said the pound barely reacted, as the survey showed input prices rising, which pointed to inflation remaining above target and the Bank of England needing to raise interest rates, as it is expected to do in May. He said: "As a policymaker you would look through the weather-related weakness. "Neil Jones, head of FX hedge fund sales at Mizuho bank, said: "Fingers will point to the Beast from the East, but my sense is longer term underlying issues remain in play, especially given this is the weakest number since the Brexit vote."